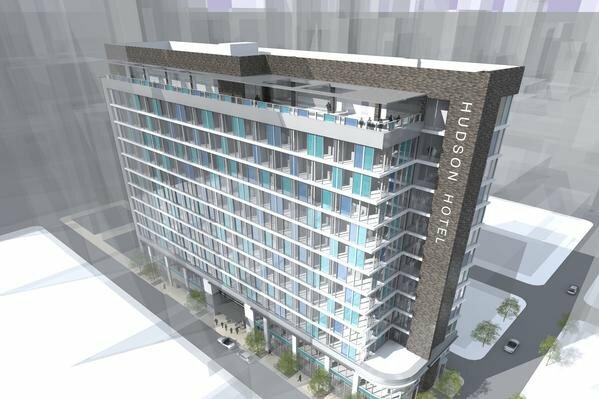 The Hudson Hotel is proposed to be built at 17th and Chancellor streets. The proposed $125 million Hudson Hotel at 17th and Chancellor streets is another step closer to approval after the Center City Residents Association opted not to oppose it. Last month, the association met to discuss the fate of Little Pete's, a longstanding Center City diner that would be taken down as part of the Hudson Hotel's construction. The Philadelphia Business Journal reports that a vote held by the association has cleared the way for the project after developers resolved several issues including lighting and streetscaping. The proposed 12-story hotel would have 300 rooms, a rooftop restaurant, underground parking, and retail space.